With many of the competing drivers swapping over to the Traxxas big bore and the Dravtech shocks from Europe we noticed an area of tuning we could help again. Now theres a lot of options out there for the Traxxas big bore shocks, different variations for different conditions but for the most part its all racing. The Dravtech shocks from Europe are a great upgrade but only offer you two piston options for rock crawlers. Shocks are just as import in rock crawling as finding the right foam setup or link geometry. Coming from a racing back ground we know a bit about shocks and what effects can help or hurt us. Last year we brought the market a tuner set of pistons for the popular SCX scaler shock. With the popularity of them and knowing they helped some World Class drivers we felt our concepts and theories could help in the bigger bodies. So what makes these worth the rebuilding time? Why would these work better for rock crawling? First all the pistons are CNC Machined out of Delrin and feature an oil valley groove in them on one side. This groove helps in oil flow guidance through the actual holes and less blow/pressure on the actual pistons. Helps smooth out that initial movement on impact. Next is the distinction in piston hole sizes, we went with our theory of smooth flow for best shock pack and feel. To do this we could have gone with big holes and less of them, like your typical 3 hole pistons but we decided to go with 6 hole pistons for better options. So lets break this down to why and it has some to do with racing and we know rock crawling is not a speed sport but shocks are shocks. So with a 3 hole piston we have a linear flow to our shock oils, meaning as we initially compress them the oil allows the piston to move. As we cycle through our shock stroke the shock seems to feel too heavy, almost like our oil is too thick. We start out our tuning to a lighter oil or drilling the piston our for bigger holes. Now whats happening is as the piston is cycling through its stroke the holes are actually causing the oil to build a resistance, a shock pack we call it. But whats happening is we are not really tuning for what we want or our trucks want, we are tuning so the shock can do what it wants. Imagine that shock cycling up then quickly extending from dropping in a hole then cycling back in, our terrain isnt flat. Ever feel like your truck gets tougher to drive or acts weird about half way through a course? Thats the effects we are feeling of our shocks changing inside. Now with 6 hole pistons we are able to equal out that flow and resistance giving us a more consistent liner feeling with less shock pack. As the piston cycles through all its strokes the oil is less able to build resistance or even bubble up inside. This gives you a more consistent feel in the truck from start to end on courses. Another tuner option we have now is hole sizes. We opted to include 4 variations of choices in each set. 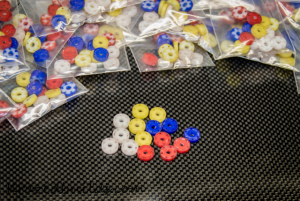 So many options and the great thing is you can mix match and still have extras left over for your U4 Racer or even basher. And we color coded them all for easier identifying. Hows the hole sizes break down?